ExxonMobil’s third drillship, Noble Tom Madden, has been contracted. The Noble Tom Madden is currently moored in an area in the Gulf of Mexico just south of New Orleans where rigs not in use are stored. With a lot of capacity in the industry, many drillships are currently warm stacked or cold stacked awaiting contracts, according to a government statement. 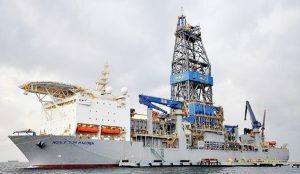 This will be Noble’s second rig under contract to ExxonMobil in the Guyana basin. The Noble Bob Douglas is currently developing the Liza 1 Field for production with first-oil expected by early 2020. ExxonMobil says it has 19 targets to drill in what has become a world-class oil field. Oil production is planned to begin in early 2020 with revenues for the country to begin being used for development projects soon after. Local operator ExxonMobil’s affiliate, Esso Exploration and Production Guyana Limited (EEPGL) is operator of the Stabroek Block, holding a 45 percent interest, Hess Guyana Exploration Ltd. holds 30 percent interest and CNOOC Nexen Petroleum Guyana Limited holds 25 percent interest. Noble is a leading offshore drilling contractor for the oil and gas industry. The company owns and operates one of the most modern, versatile and technically advanced fleets in the offshore drilling industry. Noble performs, through its subsidiaries, contract drilling services with a fleet of 24 offshore drilling units, consisting of 12 drillships and semisubmersibles and 12 jackups, focused largely on ultra-deep water and high-specification jackup drilling opportunities in both established and emerging regions worldwide.